Posted on Sat, Mar 10, 2012 : 5:59 a.m. It was the night of May 16, 2011, when my very pregnant wife sent me into open political revolt against Ann Arbor’s mayor and City Council. My dissatisfaction had been rising and the $100 million of mismanaged and wasteful building projects (the “Rog Mahal,” the “Big Dig” and the “Hurinal”), our roads in increasing disrepair but not being fixed, and police department cuts that impacted the safety of downtown residents were all vexing me. However, it wasn’t until I came home looking forward to a relaxing evening after a hard day of work that a discussion with my wife about cuts in the fire department pushed me right over the edge. Over dinner, I informed my wife that I had learned earlier in the day that if there was a fire in our building, under a new staffing policy “experiment,” Ann Arbor’s only tower truck, stationed two blocks away downtown, would no longer be able to respond to rescue my wife or young son in our 10th floor downtown condo. One of the city's two ladder trucks is used to fight a fire last August at the former Sheesh restaurant on North Main Street. “What are you going to do about it! ?” was my wife’s reply. So an hour later, there I was, speaking to the mayor and City Council during the public comment period at a city budget hearing about why this and the other planned public safety budget cuts were rank insanity. My efforts failed. Mayor John Hieftje announced that he was “comfortable” with the “experiment” to cut the public safety budgets and the citizens who spoke up were ignored. The city chopped $1 million from the fire safety and police departments. Seven police employees were fired -- including a young hero who had just recently waded into a raging gun battle to quell a downtown 3 a.m. post-bar brawl -- and six more positions eliminated. Seven firefighter positions were cut. 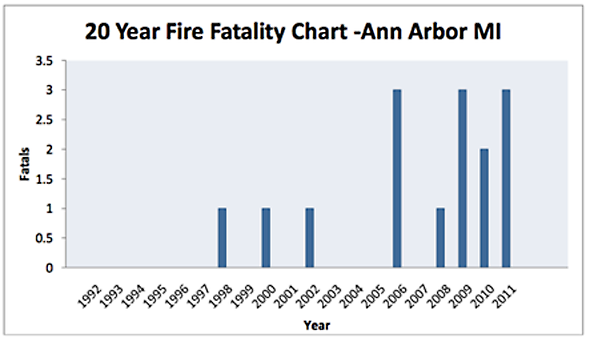 In the last 20 years, 15 citizens lost their lives to fires in Ann Arbor, including four just in 2011 and 12 since 2006. The rate of death by fire has increased tenfold to an average of 2 per year from the rate in the prior 15 years. The rise in deaths began when the fire department cuts began and there is a tight statistical correlation. Fast forward a year and we learned that the $1 million in cuts were never required, as the city’s general fund ended that fiscal year with a $965,000 surplus. The city commissioned a report about our fire department from fire safety consultants, ICMA. Not surprisingly, the city’s report concluded that the staffing levels were inadequate and that the city was not meeting national fire safety standards. The implications of not meeting the National Fire Protection Association and ISO fire standards are that our homeowner insurance rates will rise as the city’s fire safety rating at ISO falls. But staffing levels have continued to fall and currently, the fire department has 76 staff, 18 fewer than when ICMA did the research for its report. What was inadequate then, is extremely unsafe now. Until 2000, when the cuts began, we had more than 120 fire safety employees. Recent revelations are even more disturbing. My research indicates that the fire department’s tower rig was out of service for mechanical faults 174 days in 2011, and every day of 2012 so far. According the president of the local firefighters union, Matt Schroeder, “the tower must be repaired or replaced.” In addition, Ladder 5, was out of service 34 days last year and has been frequently out of service in 2012. When Ladder 5 is out of service, Ann Arbor’s firefighters have no working ladder trucks to respond to a multi-story building fire! According to Schroeder, if there is a fire in a multi-story building in Ann Arbor, anyone needing rescue by ladder above three stories cannot be rescued until a ladder truck from a neighboring community arrives. There is no plan to correct this serious problem any time soon. Ann Arbor has many buildings over three stories and more are being approved by City Council. It is extremely irresponsible to build additional 10- and 12-story buildings downtown when people above the third floor cannot be rescued. We are one stupid student with a hot plate that overheats away from a tragedy. While pursuing my revolt against Mayor Hieftje and the City Council block that supports his policies, I’ve become a frequent commenter on AnnArbor.com and this has led to two results. First, many comments have been made suggesting I run for mayor against John Hieftje. I have decided not to run for mayor in 2012. I am sorry to disappoint my supporters, however family and work must come first for me for the next year. The banking business is still challenging these days and my young family needs my devotion. And, with my decision not to run for mayor, AnnArbor.com has offered me an opportunity to write a regular community opinion column, giving me the opportunity to expand on my observations with more facts and background information. This doesn’t change the fact that we all need to lobby the mayor and city administrator to add more funding to the Ann Arbor Fire Department to hire more staff and replace or repair the city’s ladder trucks. This year’s fire budget calls for 5 more positions to be cut and that also must change so that we can again meet national fire standards for response times and other key metrics of fire safety performance. Stephen Ranzini is president of Ann Arbor-based University Bank. He is a former community member of the AnnArbor.com editorial board. Fri, Dec 14, 2012 : 7:52 p.m.
Tue, Dec 11, 2012 : 1:23 a.m.
Sun, Mar 11, 2012 : 2:04 p.m.
Sun, Mar 11, 2012 : 1 a.m.
Tower 1 which is the cities downtown ladder truck has a cracked frame. It could possibly be welded but it's a very very expensive weld. Even after its done it still may not fix it. The reason is that frame has to be 100%. It supports a 100 foot ladder fully extended with the possibly of it flowing 1000's of gallons of water with firefighter working at the tip in the bucket. A cracked frame is bad bad news. It has to be completely dependable. So you can spend a lot to weld it and then the possibility that it still won't hold. On top of that it's an older truck that has other problems. I'd rather have a new one. But that's just cause I could be in bucket when it fails and I'd like to see my kids grow up. Sat, Mar 10, 2012 : 11:18 p.m.
Sooo the mayor and city council keep aproving all these high rise buildings in Ann Arbor, yet our fire department does not have the capabilities to deal with an emergency at these locations. Excellent, but no worries we have an art millage so all is good in the world. Sat, Mar 10, 2012 : 9:22 p.m.
@Ralph McGraw &amp; @sailor67: I am well aware that 8 floors up is the effective reach of the tower truck and that Ladder 5 can do even less. In our particular building, we can climb down and around on a series of balconies to lower floors, including balconies on floor 7. My concern is not only personal but for the hundreds (thousands?) of residents especially students who live above the third floor, and the reputation hit the city will take in the national press if a fire destroys a tall building with large loss of life and our equipment is out of service. The city only has $20 million of insurance per event and that isn't enough to pay the inevitable lawsuit for negligence that will come. Lastly, Ann Arbor made ABC's national Good Morning America this past week for the rash of home break-ins we are having this year. Such bad press is very bad for business and the community's national image. We must be vigilant to avoid these kinds of PR disasters. Sat, Mar 10, 2012 : 8:58 p.m.
At the risk of sounding &quot;argumentative&quot;, if no fire truck in the immediate area can provide rescue operations for a building more than 10 stories tall, why was the building allowed to be built in the first place, and/or why didn't the author take this into consideration prior to renting/buying a condo on the 10th floor? Seems if someone is concerned about their family's safety, it might be THEIR responsibility to investigate that little tidbit prior to moving into a building that tall. Just sayin'. It's unfortunate that the author's choice of framing this issue in the context of his own family has caused readers to mistakenly feel as if it does not affect them. It does. This is an issue of response time and response capability, both which are seriously deficient. It's not only about where we live, but where we may be during our daily life. For example, UM Hospital certainly does not permit selection of floors when admitted, seeing doctors, nor do private offices across the city. Can you imagine if a higher-floor fire hit a UM dormitory, library or school? Perhaps what's worse than the situation described by Mr. Ranzini is the rampant apathy on the part of the Ann Arbor residents. I pray that there is some more 'revolt' (using the author's word) before, during and after the next election cycle. Sat, Mar 10, 2012 : 8:31 p.m. I'd like to know what the mechanical problems have been with the specific ladder trucks. That would make it easier to decide if they should be fixed or replaced. Sat, Mar 10, 2012 : 7:51 p.m. The statistics on number of firefighters and number of deaths is irrelevant unless there is some evidence that those deaths were the direct result of less service. 1992 to 1997 saw no deaths when numbers were higher but that does not mean that any deaths were prevented. Also when the numbers declined we still saw no deaths from 2003 to 2005. In regard to replacing a ladder truck, the amount of time it takes to get one is (should be) immaterial. I have spoken to fire fighters and they tell me they know how long trucks typically last and when they should be replaced or put into reserve. So if AAFD needs a new truck and they know how long it takes to get one, the process should have started at the appropriate time and to not do so makes me question the validity of that &quot;issue&quot; here. Also, there should be a capital fund for equipment in the FD budget for equipment replacement. Don't see anything about that in any FD stories. Is there no capital fund? Sat, Mar 10, 2012 : 6:49 p.m.
@YpsiVeteran: I believe that you are 100% correct! 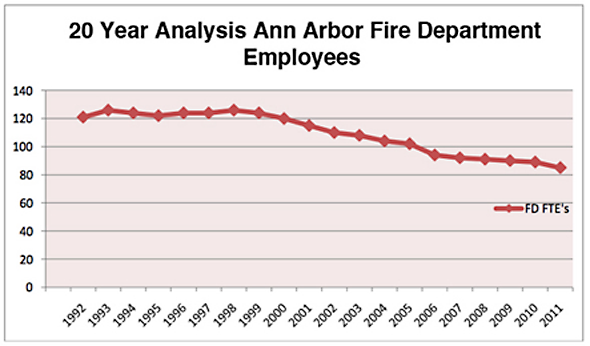 The fire inspection and prevention department in Ann Arbor was obliterated by the cuts and last I heard they only had one fire inspector left, and she had only recently been trained. In my opinion, the decrease in prevention efforts as this staff was cut to the bone, is why the deaths have increased so much and the severity ofnthe fires has increased. Sat, Mar 10, 2012 : 7:08 p.m. Inaccurate and/or missing pre-plans can be disastrous for a community, and that's not hyperbole. Imagine the differences that might be necessary between an evacuation plan for an all-residential four-story apartment complex, and a four-story mixed-use building with 3 hair salons, a restaurant and a jeweler on the first floor and apartments on the top three. As firefighters, would you route people down interior steps from upper floors if you knew that closets filled with volatile color-processing solutions were adjacent to the stairwells? What if you didn't know? Most buildings have multiple routes of egress. If the first time a firefighter ever sees the interior of a building is when it's on fire, he or she might as well be blindfolded in there. People think that operating a fire department is as simple as waiting for a call, pulling up and pumping in water, but that's not the case. Sat, Mar 10, 2012 : 5:54 p.m. The risks from understaffing aren't just reactionary. The responsibility of a municipal fire protection agency isn't just to put out fires, it's also to be a proactive force for fire prevention and fire response planning. 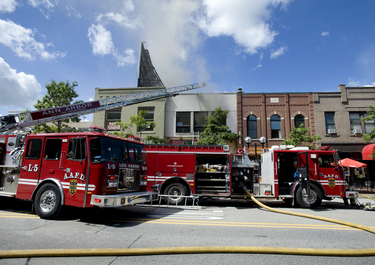 Fire departments develop &quot;pre-plans,&quot; especially in urban, mixed use areas. Firefighters go to businesses, factories, multi-use buildings, etc. and survey the physical layouts. They speak with business owners, survey and record the locations of chemical storage on-site, review the fire suppression systems, etc. They develop written diagrams of buildings (and each business in a building) and plans for deployment in case of fire. If a commercial cleaning operation has three storerooms filled with solvents and other cleaning solutions, it's nice if firefighters know about it before it blows up. Pre-plans are carried on trucks or taken along on calls. Firefighters train with them. If there's only enough people on duty at any one time to staff the trucks and respond to calls, proactive activities are either severely reduced or eliminated. Entire communities suffer, and the likelihood of civilian and fighter injury or death is increased. Sat, Mar 10, 2012 : 6:56 p.m.
Typo correction -- last sentence above should read, &quot;...civilian and firefighter injury...&quot; Sorry! Sat, Mar 10, 2012 : 5:48 p.m. The three most important priorities for a city government are: 1) Public Safety; 2) Public Safety; and 3) Public Safety!!! Thanks for pointing out and posting these figures. I don't know your politics, but I would vote for you on this basis (Public Safety) alone! Sun, Mar 11, 2012 : 2:43 a.m.
@aes: Thanks very much for your kind comments, which I appreciate very much. In social issues I consider myself liberal and in fiscal matters financially conservative (having started out as a scholarship student with no money whatsoever, I still am frugal, appreciate the value of money and hate to see it wasted). University Bank and I have been strong supporters of the Ann Arbor and Washtenaw County Democratic Party over the years. When I was married my wife and I invited many local Democratic politicians, who are our personal friends, including Sen. Alma Wheeler Smith, Sen. Rebekah Warren, Rep. Pam Byrnes, County Commission Chair Conan Smith, Rep. Chris Kolb. Rep. Jeff Irwin and Senator Rebekah Warren were elected with my vigorous backing and Alma Wheeler Smith is the chair of University Bank's board. I donated to help get President Obama elected. Lastly, if you are unsure where I stand or would like to chat in person please come to the fundraiser I am co-host of on March 15th at 5pm to 7pm at University Bank's HQ for Gary McDowell, a Democrat, who is in the lead to win the Northern Michigan congressional seat back from Rep. Benichek, a Republican. My co-hosts are Rep. Jeff Irwin and Congressman Dingell. Sat, Mar 10, 2012 : 4:41 p.m.
Stephen, great article. If I may ask... you were running a pseudo-naming competition for the artwork. Just curious -- was there a result from that? Sat, Mar 10, 2012 : 6:01 p.m.
@Kai: I have the results (we received lots of votes) and will be sending an email with the results out to the people who took the survey. Getting this first article done took priority, as I wanted to finish my research and submit it before Monday's city council fire safety annual budget meeting. Thanks for your patience and thanksvfor taking the survey! Sat, Mar 10, 2012 : 4:38 p.m. I find many aspects of this opinion piece disingenuous with plenty of overt self-promotion. For example, take the graph of fire deaths. Let's take a look at 2011 specifically in which there were three fire deaths. If you read about them in the following links, you'll see that lack of smoke detectors and lack of fire exits were implicated and not response times or fire department budgets. <a href="http://www.annarbor.com/news/2-in-critical-condition-following-blaze-on-south-state-street-in-ann-arbor/">http://www.annarbor.com/news/2-in-critical-condition-following-blaze-on-south-state-street-in-ann-arbor/</a> <a href="http://www.annarbor.com/news/lawsuit-filed-in-fatal-fire-on-south-state-street-in-ann-arbor/">http://www.annarbor.com/news/lawsuit-filed-in-fatal-fire-on-south-state-street-in-ann-arbor/</a> <a href="http://www.annarbor.com/news/ann-arbor-issues-code-violations-against-owner-of-home-where-two-died-in-fire/">http://www.annarbor.com/news/ann-arbor-issues-code-violations-against-owner-of-home-where-two-died-in-fire/</a> Or read about the three deaths that occurred in 2009; here the problem was contradictory and incomplete location information coming from multiple people reporting the fire along with a lack of smoke detectors. <a href="http://www.annarbor.com/news/autopsies-underway-on-fire-victims-officials-say/">http://www.annarbor.com/news/autopsies-underway-on-fire-victims-officials-say/</a> Perhaps someone else can find the details of the 2010 fatalities. Mr. Ranzini uses the graph to hide key details and encourage readers to come to false conclusions. Sadly, he uses these tragedies for his own self-promotion. Sat, Mar 10, 2012 : 8:38 p.m. In the &quot;big picture&quot; of fire prevention, it's not just the trucks and the firefighters that are used to stop fires. There are inspections of facilities to see whether or not they comply with current fire codes. Unfortunately, non-rental residences are rarely, if ever, inspected for smoke detectors, etc. Another poster also mentioned that education is a large part of fire prevention, including educating people about the need, use, and maintenance of smoke detectors. Lack of firefighters and trucks may not have contributed to the deaths in 2009 and 2011, but a lack of education and inspections just may have contributed to those deaths. Ann Arbor deserves the best in local services. The community is too affluent to not be able to afford the best in city services. Sat, Mar 10, 2012 : 3:44 p.m.
continued In lieu of paying overtime. We had devised a plan so as not to go over the budget bottom line due to overtime. I wasnt asked if we could keep stations open I was told to close them. My reaction was purchase large signs to post at closed fire stations to inform the public, boldly post on the Fire Department web site the fact that there would be closings and lastly I resigned as I told the firefighters when I came to Ann Arbor I would never compromise safety for political reasons. I miss that job and those people but I sleep at night knowing I wont be responsible for a preventable injury or death to a firefighter or citizen. Sat, Mar 10, 2012 : 3:38 p.m. Sat, Mar 10, 2012 : 11:53 p.m. Sat, Mar 10, 2012 : 6:12 p.m.
@Dominick Lanza: I really appreciate your willingness to speak up publicly about what you know from your experience as fire chief. The citizens really need to understand the depth of the problem. Excellent posts!! Sat, Mar 10, 2012 : 3:09 p.m. Thanks for taking your time to put this information out there. In response to some of these questions regarding fire trucks. Most departments hire a company to perform a DOT inspection on an annual basis. Everything is checked from the windshield wipers to the rear bumper. All flaws are noted and categorized by severity. A structural frame flaw would cause the truck to be taken out of service immediately. Then a more intense inspection with specialty tools is done. I do not know who does the city inspections. I am sure that this would be done long before the thought of purchasing a $900K rig is considered, even during the best of financial times. As far as who has the nearest ladder trucks, I believe Pittsfield has 2, Ypsilanti has 1, Ann Arbor Township has 1, Superior Township has 1, Dexter has 1, and Chelsea just ordered a new one. In the end, when you shop for living and working locations, always keep safety in mind, and ask questions of your realtor. Maybe if enough realtors start asking questions, the city will start to listen. Either way, spring forward, CHANGE YOUR BATTERIES and make sure that you and your loved ones are as protected as they can be. Sat, Mar 10, 2012 : 2:49 p.m. Sat, Mar 10, 2012 : 2:35 p.m.
Another failure by the dem dominated city council. They have lost sight of the fact that the primary function of local government is public safety. Is there a correlation between the number of fatal fires and the decline in AAFD fire fighters? It appears so on the surface. Another failure by the so called enlightened intellectuals who keep re-electing this group. Sat, Mar 10, 2012 : 2:27 p.m. I like your thinking Mr. Ranzini, a lot! You may do more good writing articles here, exposing the truth and the bungling peanut gallery, than actually being Mayor, keep up the good work! Sat, Mar 10, 2012 : 2:02 p.m.
yup another example of what we can do with the 1.6mil in the art commission bank account. money available for transfer. Sun, Mar 11, 2012 : 2:10 p.m.
oh can't do that it wouldn't be POLITICALLY CORRECT. Sat, Mar 10, 2012 : 1:58 p.m.
Stephen - thank you very much for your marvelous article regarding the issues surrounding the Ann Arbor Fire Department. Having in the past been a part of the department, I truly appreciate all that they do to save lives and property and for the community service they do. We, the citizens of Ann Arbor, should be extremely proud of the AAFD and need to continue to move forward to bring the crew up to proper staff and have the proper equipment to keep the citizens of Ann Arbor safe. Please folks, take heed, speak up and be heard. And, as mentioned a in earlier comment, as the fire safety goes down, insurance rises. Sat, Mar 10, 2012 : 1:48 p.m. I have communicated to my Ward 1 council members on numerous occasions in the past and also in their surveys on the problems of not addressing city core services. Yet when you watch the city council broadcast. They spend hours upon hours in discussions on frivolous things like marijuana laws and recently the county wide transit authority. There is this wonderful grand vision of the Major and many of the council members for a high density Ann Arbor. Somehow they forget that a high density population needs higher density of fire and police protection. We should just stop wasting our time communicating with the city council because they have different priorities. We never see them discussing for hours the need for better protection. We need to VOTE and replace them with people who will hear our voices. Maybe the leader needs to go first. Something is clearly out of kilter here in Ann Arbor. We spend money on NAP which goes around starting fires ,while at the same time we cut back and can't maintain fire protection. Sat, Mar 10, 2012 : 1:37 p.m. I am still considering running for Mayor for the 3rd and last time but as I read your comments over the last few months I realize that our views on city politics are similar in many ways . I was hoping that you would run for Mayor so I could step down and support your campaign. Even though I see you at church I have not had the opportunity to meet and discuss City Politics with you. Hopefully we can do that in the future. If you change your mind to run for Mayor you have my support and almost 32 % of the Votes from the last election to support you. Sat, Mar 10, 2012 : 1:22 p.m. So how high (feet) can the fire trucks go current go at this time? Some houses in AA are tall and we now have many construction projects being built that are tall for this city. Imange all the lawsuits against the city if something happened? Especially because this is &quot;now it is well known&quot;. Any lawyer will have any easy win if the city gets sued for this kind of negligence. Sat, Mar 10, 2012 : 1:14 p.m.
Stephan, While I agree with many of your arguments, you really need to understand that your 10th floor condo is beyond the reach of every aerial ladder currently operated by any fire department in SE Michigan ... including Detroit. Assuming perfect access at the curb, a perfect tactical placement for your specific condo, and using the maximum reach of a 125-foot aerial laddder ... that ladder is still gonna' come at least one floor short of rescuing you and your family. There are a couple of realities that everyone currently in the Public Safety professions understand: Police, Fire &amp; EMS departments can (and will) only be as large as the community is willing to finance. Unlike the past, staffing levels of today's Fire and Police departments are based on need and money - not want or tradition. Crime will occur even if there's a cop on every corner and fire fatalities will occur even if there's a fire station in every neighborhood. Fire deaths are directly related to the sophistication of the fire prevention program - not to the size or location of the fire suppression forces. No matter where you reside, never live above the 7th floor. Sun, Mar 11, 2012 : 2:13 p.m. If A2 allows them to be built they should be able to provide protection for them.i mean it's not like a 100 floors high. Sat, Mar 10, 2012 : 7:59 p.m. I would add that your best fire protection should be built right into your building. Put on scuba gear, take a cigarette lighter and set off one of your sprinkler heads. If your system, which should be made out of metal, works, you will instantly be much more comfortable with your level of fire protection. If your building is destroyed it may be more due to your building's fire protection system being out of order than your fire department. If your building is constructed of wood, keep worrying. Sat, Mar 10, 2012 : 1:28 p.m.
@sailor67: I am well aware that 8 floors up is the effective reach of the tower truck and that Ladder 5 can do even less. In our particular building, we can climb down and around on a series of balconies to lower floors, including balconies on floor 7. My concern is not only personal but for the hundreds (thousands?) of residents especially students who live above the third floor, and the reputation hit the city will take in the national press if a fire destroys a tall building with large loss of life and our equipment is out of service. The city only has $20 million of insurance per event and that isn't enough to pay the inevitable lawsuit for negligence that will come. Lastly, Ann Arbor made ABC's national Good Morning America this past week for the rash of home break-ins we are having this year. Such bad press is very bad for business and the community's national image. We must be vigilant to avoid these kinds of PR disasters. Sat, Mar 10, 2012 : 12:45 p.m.
Oh, so silly. Why a new truck? One day it was working and suddenly it was not? Did it crash? If it is just deemed to be &quot;old&quot; fix it. We need it ASAP. Buying a new truck should be done in a planned, orderly fashion, not in a panic. Like planning for a prom! Are they going to now pay top dollar and buy the first one available and pay a &quot;rush&quot; for it? Or will we suffer this danger even longer? What if a dorm catches fire? What is wrong with this silly mayor and council? Oh, so silly!!! Oh, so disgusting. What a fool, a Hurinal instead of a working hook and ladder truck and crews. This summer, I hope that local dogs use it appropriately, unstead of a fire hydrant. Sat, Mar 10, 2012 : 12:59 p.m.
&quot;This summer, I hope that local dogs use it appropriately, unstead of a fire hydrant.&quot; The ladder truck or the mayor? Sat, Mar 10, 2012 : 12:51 p.m. Sat, Mar 10, 2012 : 12:27 p.m. I say the mayor is to blame and let him get us out of this mess, or no next term. Mr mayor get this solved, because we have been screening and you just sit and ignore us. Now you see the light and its not very bright. Get to work Mr. Sat, Mar 10, 2012 : 12:23 p.m.
so how much to replace the ladder on the existing truck. If it just needs a new ladder then replace it. The truck will be sold off to some other township or village, and they will have to replace the ladder also. Sat, Mar 10, 2012 : 12:21 p.m.
Ann Arbor needs such a capability, we need it downtown, and we need it available 24/7, and as fast as the minutemen of 1776 "…anyone needing rescue by ladder above three stories cannot be rescued until a ladder truck from a neighboring community arrives…" Wow. My first thought was which surround communities have a ladder truck, since they have no tall buildings? The only possibility would be Ypsilanti, which is a smaller city with its own financial "concerns". Canton? Plymouth? It just is such a misuse of city funds to not keep a ladder truck in a state of repair, even if it were 40 years old. "… There is no plan to correct this serious problem any time soon… Is the mayor, and council, nuts? Sat, Mar 10, 2012 : 12:07 p.m. The mayor was willing to cut safety budgets without a good plan to replace the status quo. The ladder truck should always be in working order, with crews trained and on hand to operate it. This did not happen. During this prolonged period of economic downturn and lowered property values that directly affects municipal revenues, Mayor Hieftje is correct in that the city may need to make cuts to its budget, But he is so very wrong is his methods. Stephen Ranzini is correct to highlight the errors of his ways. The mayor seeks to save pennies, to waste on the afore mentioned BIG DIG, the Shaft, etc., while city residents meanwhile pay more in increased insurance and vehicle repair. 1)"…homeowner insurance rates will rise as the city's fire safety rating at ISO falls.." 2)Bad roads ruin car front ends, tires and such. They also can cause bicycle accidents that lead to medical costs. Or much worse. I thought the mayor was pro-bicycle? The mayor is content to allocate police officers for a speed trap by Howard Cooper on an early Sunday morning, but not to enforce handicapped parking downtown on Sundays. This is a mayor that does not know how to properly allocate scarce resources, especially the most important, police, fire, roads, utilities. Art and BIG DIGs should be at the back of the line, not at the front. Sat, Mar 10, 2012 : 11:42 a.m. Here is an update with some additional research that came in after the column was submitted. A reliable source informs me that it can take up to 11 months to order, have built and delivered a new ladder truck of the type Ann Arbor needs to replace. We could face this unsafe situation for almost another year even if City Council acts immediately. Sun, Mar 11, 2012 : 2:18 p.m.
Mr. Ranzini why not start the process NOW to get a New Truck.Also the x chief says every manufacturer has available stock they can get ready in TWO WEEKS. Sat, Mar 10, 2012 : 9:17 p.m.
Mr Roberts and Mr Lanza - Thank you for the additional information. I have a much better appreciation for the situation. I asked a number of questions on the two trucks at the township hall and got what I thought were straight answers. Your answers provide background I did not have. Thank you again. Sat, Mar 10, 2012 : 4:39 p.m. Sat, Mar 10, 2012 : 4:33 p.m.
@DondoBee: Superior Township is not quite an apples to apples comparison with the City of Ann Arbor. Regarding your first point of the truck taking two years to complete: This is true, however it's because they chose to go with a custom truck from KME because of their close ties to the sales representative in this area. There were several other vehicles that were available from other dealers that were already built, but none of them submitted a bid because of the verbal commitment to buying the KME. A flawed process? Yes, but that's the direction they wanted to go. Your second point of the trucks being in working order because of the care of the firefighters: I'm sure the AAFD employees care about their vehicle maintenance, and no doubt do all in their power to maintain the vehicles. The Superior Township trucks were over 20 years old, had been down for numerous maintenance issues, and if I recall right, the second engine hasn't been run at all within the last year as they stripped most of the equipment off of it. The &quot;durability&quot; of those vehicles probably has more to do with the call ratio of AAFD vs. Superior Twp., of which I would estimate that Superior does around 1000 calls per year vs. AATFD being 5-6x that. I will say kudos to the Township for saving up the money for trucks, however, it comes at the sacrifice of reduced staffing. Three firefighters on duty per day does not meet the NFPA criteria for fire suppression. It's unwise to have more trucks in the building than firefighters in my opinion. Sat, Mar 10, 2012 : 1:41 p.m.
Mr. Ranzini - Superior Township just bought a new fire truck. From signing the contract to delivery was almost 2 years. The good news is, the truck it replaced was in working order (thank to the loving care of the fire fighters). We are about to buy a second one. It too will take approximately 2 years to be delivered. I want to thank the township for saving up over the life of the truck for the replacement. In both cases the money was on hand to buy the replacement vehicle. Why, driving with it up, it bouncing and stressing it? Wear from being extended up over time, I wonder. Can it be welded? New I-beams. If B-52s from the 1950 still fly for the US Airforce and many vintage cars are seen on the roads, why can't this be fixed? Has the AAFD shared with yu some of their cost estimates to repair the truck? Certainly they did this prior to deciding just to get a new truck. I hope they did. @Silly Sally: the tower truck's frame is broken. According to the president of the local firefighters union, Matt Schroeder, "the tower must be repaired or replaced." *IF* repair is not a good option (that decision hasn't been made yet despite the problem existing for over half a year) a new tower truck needs to be purchased, however, it may take a long time to get one built and delivered. Sat, Mar 10, 2012 : 12:47 p.m.
Why a new truck? One day it was working and suddenly it was not? Can the old one be fixed in the interim?